The Presidency on Sunday denied that President Muhammadu Buhari tried to pervert the course of justice, saying that he would never authorise anybody to induce a judge to pervert the course of justice. The Senior Special Assistant to the President on Media and Publicity, Garba Shehu, in a statement made available to journalists in Abuja, advised journalists and other Nigerians to stop linking Buhari to the travails of the judges..
Two judges arrested for corruption by the DSS had claimed that the Minister of Transportation, Rotimi Amaechi, approached them allegedly on the instruction of the President to influence decisions on election cases. Justice Sylvester Ngwuta of the Supreme Court in a letter dated October 18, 2016 and addressed to the Chief Justice of Nigeria, Justice Mahmud Mohammed, alleged that Amaechi had called and asked that the the judgments of the Supreme Court on Ekiti and Rivers elections be rigged in favour of the All Progressives Congress. Ngwuta is one of those arrested by the Department of State Services between October 7 and 8. Justice John Okoro, also of the Supreme Court, had also claimed that Amaechi told him that the President and the APC mandated him to inform him (Okoro) that they must win the governorship election appeals in Rivers, Akwa Ibom and Abia states at all cost. 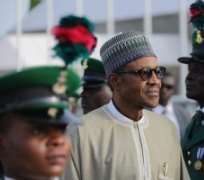 “President Muhammadu Buhari would be the last person to authorise anybody to induce a judge to pervert the course of justice,” Shehu said in the statement which is the first official reaction to the story that broke about a fortnight ago. According to aide, despite Buhari’s personal familiarity with some judges, he never used that to seek favours from them in 2003, 2007 and 2011, when he challenged the fairness of the presidential election results, from the lowest to the highest courts in the land.